Career wine professional Randy Caparoso writes about wine strictly from the perspective of food because to him, wine is a food like a rose is a rose. You can enjoy of wealth of his wisdom on his personal page, Culinary Wine & Food Adventures. He is perhaps best known as a founding partner and award winning wine director of the Roy's restaurant group. 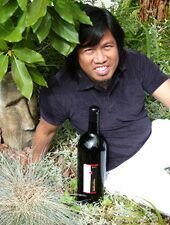 A published, Academy of Wine Communications commended wine journalist since 1981, he has also lived and opened restaurants everywhere from Hawaii to New York, California to Florida, Chicago to Texas, and in more than twenty more places in between. Please feel free to contact Randy directly to share any of your own thoughts and feedback at randycaparoso@earthlink.net. Is Lodi making California's best Zinfandels? How Is Your Contemporary Grape IQ? Restaurant vs. Retail Wine Sales -- Who's to Blame? Rediscovery of Gold in the Sierra Foothills! Is Riesling the Greatest White Wine For Food? The first historical "Sake Summit"
Soil vs. Climate: Does the Hat Make the Man? Celebrate the Great American Turkey with a Great Wine! Simple minds enjoy wine better! Sake - The "Wine" of the Future? Food and Wine in the "City"
SPECIAL REPORT: Highlights from Germany - Excursions through the Baden, Pfalz, Rheingau & Mosel-Saar-Ruwer Regions in July 18-29, 1999.